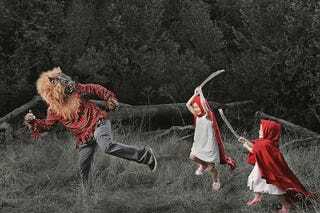 All parents love to take photos of their children, but photographer Jason Lee goes one step further, manipulating photos of his two daughters to create magical scenes. Through the whimsical power of his camera and computer, he transforms the girls into princesses, video game heroes, and other mystical beings. Lee, who posts tons of gorgeous photos — altered and unaltered — of his daughters on his blog, is a professional wedding photographer, but I think he missed his true calling. He could make a killing creating these elaborate fantasy scenes for other parents' kids.